GENUINE SUZUKI Spare wheel SPACE SAVER kit for the new Vitara and the S-cross Model, universally fits 16" and 17" wheels. 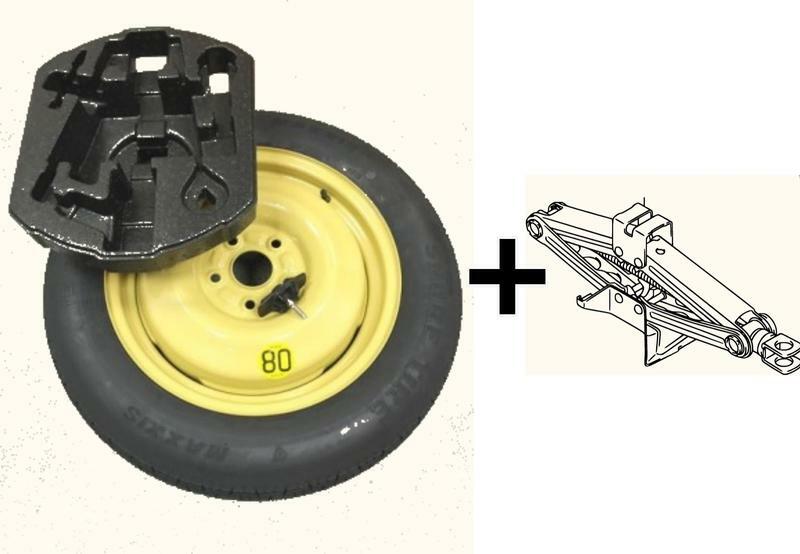 Kit contains the Wheel, fitted Tyre, Tool/Jack Holder, Jack and Wheel Holder screw. Your Vitara/S-Cross should already come with the Wrench, Lever and Tow Eye as standard in the rear to fit in this kit. Excellent value, complete with jack. Wow what service,only ordered product less than 2 days ago,had response back Gary to say order received and would be dealt with shortly,had e-mail back from Gary to say that order had been dispatched.received email and text from Argo group with date when would be delivered.Had another email and text with time this morning to say that my order was going to be delivered today,ahead of its original date.Many thanks to Gary and delivery company for such rapid response.Also great price for my space saver wheel. Super fast service, best price I could get, great communication all though the process, only downside it arrived 12 seconds early! lol. Thanks again Gary its just right. I was impressed that the spare wheel kit for my S-Cross was dispatched within 4 hours of my order. It was well packaged and as described. Excellent service. Great service and communication provided by Gary. Received item within the time scale. Very competitive prices on accessories from this garage able to provide cheaper prices than my local dealership. Agree with other reviews; Excellent Service accompanied by the supply of genuine Suzuki parts. Thank you. Bought this spare tyre and jack kit with some doubts wether it would my Vitara 1,4 S booster jet so I tried it on the car right away and it fits and functions ok. it fits perfectly into the well at the rear of the car and now I can travel without being worried about getting punctures or a damaged tyre and having to rely on the supplied pump and glue system.. Wonderful quality service (within 48 hours).' Putting Customers First' would sum up their philosophy. Very pleased with the product. If you need a genuine Suzuki part use this company, you will not be disappointed. Excellent Service accompanied by the supply of genuine Suzuki parts. Will definitely purchase from these people again when the need arises. Why can't manufacturers go back to spare wheels, foam doesn't fix all punctures. Thank you Gary for keeping me informed throughout the process of buying the kit, fits perfect. I wasnt really sure if this would fit my new S-cross, I was confused by the 16/17 inch wheel size, so I phoned to query it, Gary assured me that it was the correct fit so I placed my order which arrived in a couple of days. I cannot fault this company and will most definately use them again. I ordered a Vitara S space saver wheel which was out of stock. I was emailed when it was back in stock which was only a few days and bang on time the wheel arrived. Very good company to deal with. John. Great to have a spare wheel again. It fits perfectly into the space created for it. Fantastic service, arriving within a couple of days of ordering. Would definitely recommend both the spare wheel and seller, and would have no hesitation in using this seller again. Excellent customer service via regular updates by e-mail. The kit arrived within a couple of working days. I will definitely use this company again. Arrived quickly and packaged well. Fits straight into boot space along with the supplied jack and levers, etc. Fast Delivery, Well packaged preferable to the inflator kit supplied with the car. Ordered late Wednesday night, arrived by lunchtime today (Friday). Easy to find what I wanted on your website, order process excellent from beginning to end. Many thanks for your excellent service. D.N. Gloucester.